This month’s Daring Bakers challenge was a L’Opera Cake, which features a cake made with 6 egg whites and 6 whole eggs. *Sigh* Daring Bakers, what are you trying to do to me? Make me throw my vegan lovin’ hands up in frustration and cry “Woe is me!”? Ha! Not this gal. I happily accept your egg-laden challenge. Syrup: The joconde is flavoured with a sugar syrup that can be flavored to suit your tastes. Buttercream: The first two layers of the joconde are covered in a rich buttercream. Ganache/Mousse (optional): In some recipes, the final layer of the joconde is covered in a ganache or mousse. While not hard to make, this makes the recipe quite involved. Saturday night: I made the jaconde by replacing the many eggs with a combination of soy yogurt, Ener-G “eggs”, and canola oil. I knew that I would not achieve a sponge cake with this recipe but I believed that I would accomplish a delicious almond cake, which was exactly what I ended up with. Also, instead of two cakes I made just one. I also made my syrup ( I chose coconut flavoring) and white chocolate (I used Bittersweet’s recipe to make my own). Sunday early afternoon: I made my buttercream and I made my ganache/mousse. I used all of my white chocolate for this step and did note reserve any for a glaze, so out went the glaze from my recipe. Not a problem! I sliced up some berries to add to my layers. 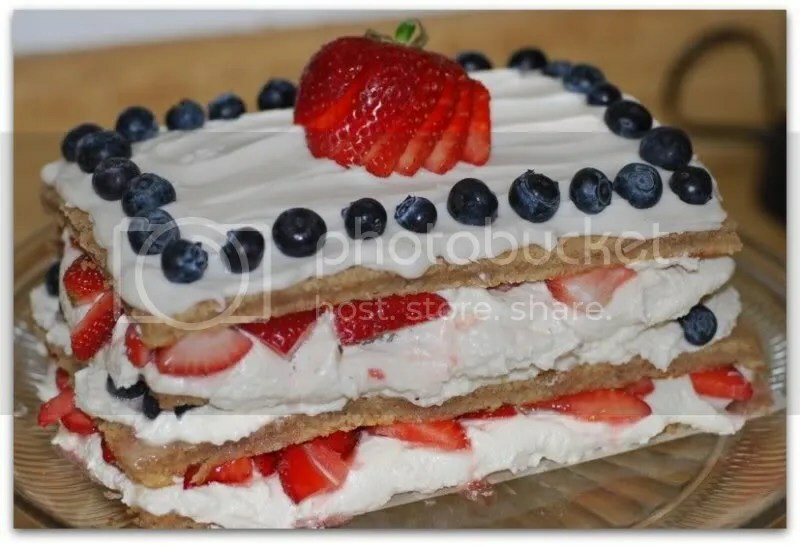 I assembled my cake and decided to leave it a bit rustic looking with rough edges (rather than smoothing them out for a more refined look) because I was planning on serving it as dessert at our Memorial Day Barbecue (the red, white, and blue look of the cake made it quite appropriate for the occasion). The cake set up in the fridge for a few hours, and it was then served to great fanfare. The cake disappeared in a jiffy and some declared it a brand new favorite. I will definitely be making this DB recipe again. Big mahalos to Ivonne from Cream Puffs in Venice, Lis from La Mia Cucina, Shea from Whiskful, and Fran from Apples Peaches Pumpkin Pie for creating this challenge. 1. Preheat the oven to 425◦F. 2. 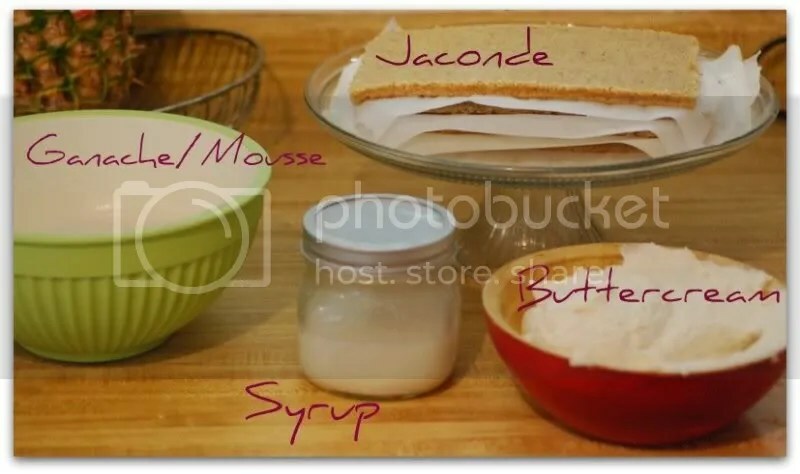 Line one 12 1⁄2 x 15 1⁄2- inch jelly-roll pan with parchment paper and brush with melted Earth Balance. 3. In a mixing bowl, beat the soy yogurt and sugar together until smooth. Set aside. 4. In a second bowl beat the almonds, icing sugar, Ener-G “eggs”, and canola oil on medium speed for about 3 minutes. 5. Add the flour and beat on low speed until the flour is just combined (be very careful not to overmix here!!!). 6. Using a rubber spatula, gently fold the soy yogurt mixture into the almond mixture and then fold in the melted EB. Pour the batter into the pan and spread it evenly to cover the entire surface of the pan. 7. Bake the cake until it is lightly browned and just springy to the touch. This could take anywhere from 15 to 20 minutes depending on your oven. 8. Put the pan on a heatproof counter or trivet and run a sharp knife along the edges of the cake to loosen it from the pan. Cover it with a sheet of parchment or wax paper, turn the pan over, and unmold. 9. Carefully peel away the parchment, then turn the parchment over and use it to cover the cake. Let the cake cool to room temperature. Beat the shortening and EB together until light and fluffy. Add the sugar and beat for about 3 minutes. Ad the extracts and soy milk and beat for another 5-7 minutes, until fluffy. 1. 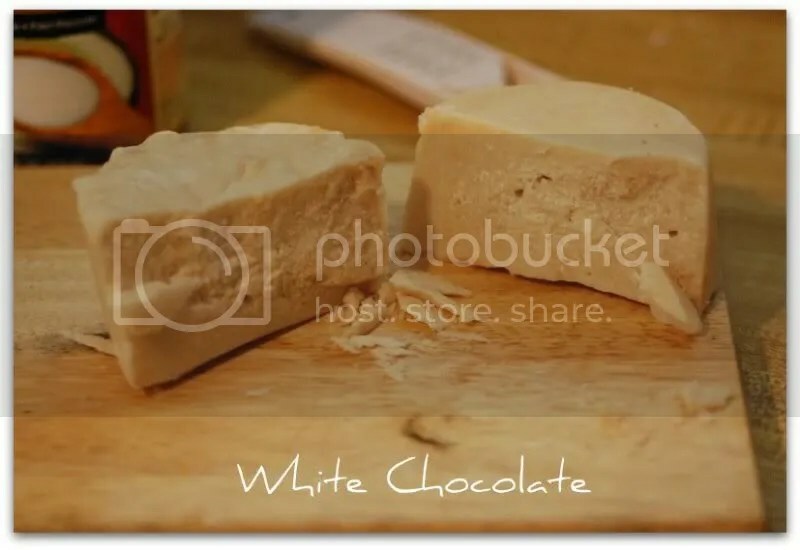 Melt the white chocolate and the 3 tbsp of coconut cream in a small saucepan. 2. Stir to ensure that it’s smooth and that the chocolate is melted. Add the rum to the chocolate and stir. Set aside to cool completely. 3. In the a mixing bowl, whip the remaining 1 cup of coconut cream. 4.Gently fold the whipped cream into the cooled chocolate to form a mousse/ganache. 5.If you’re not going to use it right away, refrigerate until you’re ready to use. 1. Cut the cake into four equal squares. Line a serving plate with asquare of parchment or wax paper. 2. Place one square of cake on the parchment or wax paper and moisten it gently with the flavored syrup. 3. Spread about one third of the buttercream over this layer. Top with cut strawberries. 4. Top with a second square of cake. Moisten this square with the flavoured syrup. and then top with blueberries. Place a third square of joconde on top of the blueberries. 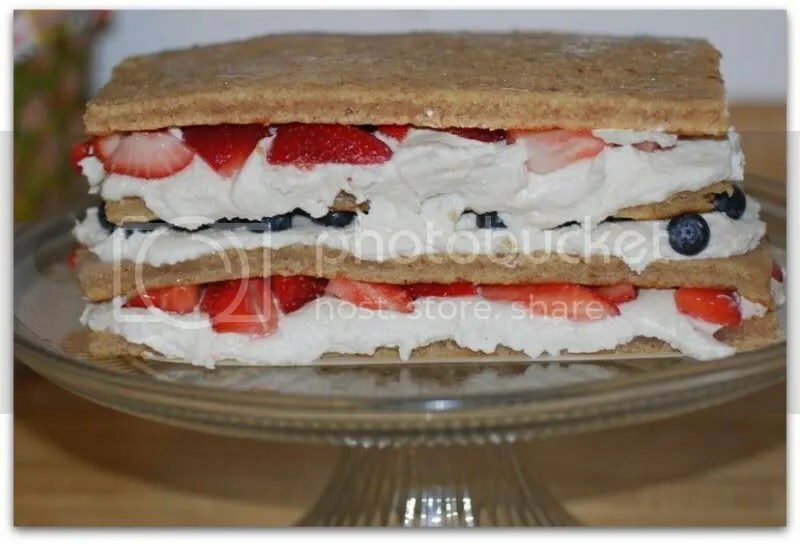 Wet the joconde with syrup, top with the remaining buttercream, place cut strawberries on top, and then place the final square of cake on top of the strawberries. Wet this cake with syrup and then refrigerate until very firm (at least half an hour). 6. Prepare the ganache/mousse (if you haven’t already) and then spread it on the top of the last layer of the joconde. Refrigerate for at least two to three hours to give the ganache/mousse the opportunity to firm up. It always amazes me how the vegan and the gluten free among us address challenges chock full of butter, flour and eggs. Your vegan Opera is stunning. Great job! BRAVO bravo!! and vegan, my heart is so glad 🙂 Your cake looks amazing, congrats on such a fabulous success! Your cake turned out beautifully. I love how you made it vegan and all your own. Fabulous job! It looks perfect for July 4th! What a perfect color combination for Memorial Day! And the flavor combination sounds soooooo good. Great job on your cake. That is one American looking French dessert! I love that you were able to make it vegan…even though I’m not vegan, it amazes me the things you are able to make and change around to fit your commitment! Great job! The cake was fabulous!! Thanks again for hosting us, we are already missing our favoriite island paradise! What a gorgeous spring cake! I would have thought a vegan version of this was impossible. Good job! I love that you made the white chocolate. 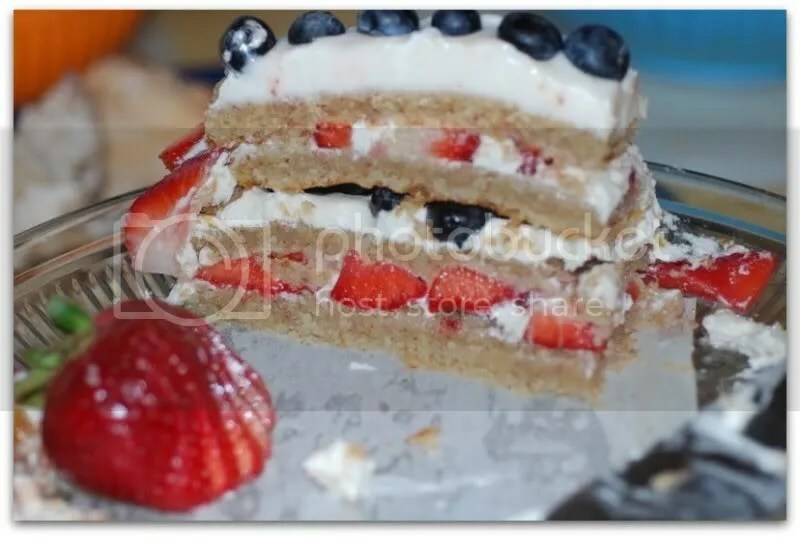 The berries in the finished cake look great! Wow! That looks good. I wish I could have a bite. I’ll give it a try. Thank you all so much for the lovely comments! I love being a part of the DB community! Great job on replacing the eggs in the jaconde. I had a hard time veganizing it and ended up making 2 different ones. I did coconut too, but used green tea with it. The berries sound so light and refreshing, I’ll have to try this one again with the berries. Your cake looks great!